The Returns Manager is where you can track products that have been returned that have not yet been added back to inventory or need to be sent back to vendors for various reasons like RMAs. Once at the Return's Manager you will be able to create a new return or manage existing ones. Creating a New Return is as easy as clicking the New Return button and entering a name, description and choosing a Vendor. 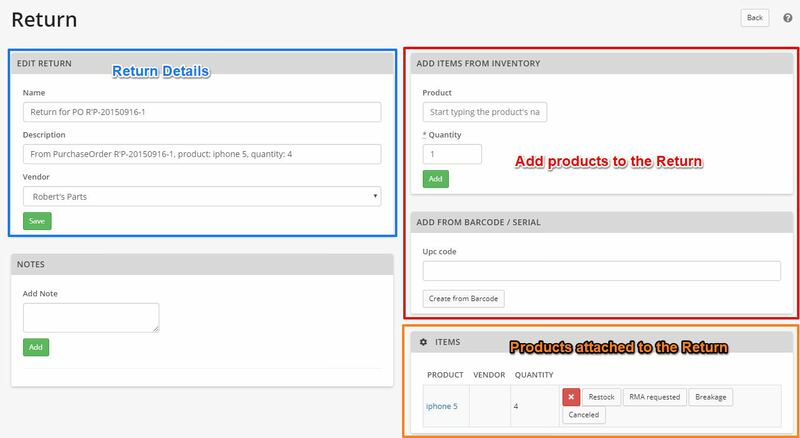 Then you can add products to the Return on the right side of the screen. Once the item has been added, the quantity selected will be removed from inventory. In the event of a serialized item, the selected serial number(s) will be removed from inventory as well. After adding your item to the RMA, you can then begin the process of tracking the return. Restock - moves back to active/available inventory and resolves the return. RMA Sent - allows you to update the status indicating that the item has been sent back to your vendor. You will have additional status updates to follow your return along the process, either of which will resolve the return. Selecting RMA Repaired will move the item back into active inventory. RMA Declined - allows you to indicate that your vendor has declined your RMA request. Selecting this will resolve the return.